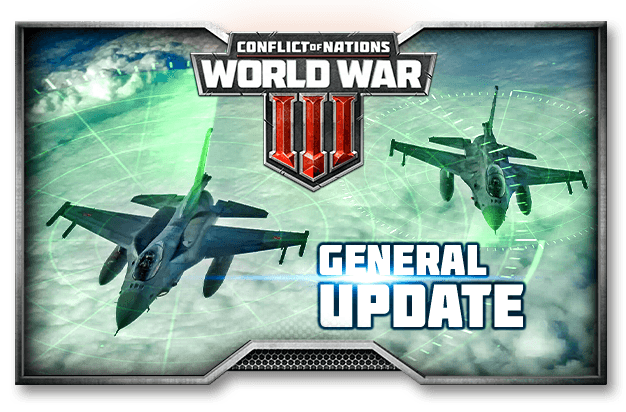 This weeks update aims to refine all aspects of the game, especially misleading (and sometimes confusing) Interface and User experience issues, along with much needed fixes. Increased the Radar Ranges to make them visible while aircraft are patrolling. Added description for "Ferry" action in Field of View section on the Wiki. Updated rank progress bar on player profile for better readability. Updated Code of Conduct Section V.
Fixed an issue where players with Security Council membership were able to start construction / mobilization through the queue button before the game started (in specific game modes). Fixed an issue where Cruise Missiles pursued their targets even though they had already moved outside of their launcher's range. Missiles will now miss if the target manages to move out of range. Fixed several issues related to commands issued for aircraft, including: Wrong arrival times, unwarranted refueling, and wrong graphics. Fixed discrepancies in the display of Morale bonuses provided by several buildings. Fixed text description in the Combat Stats (AI) information tool-tip. Fixed missing Catalonia flag on WW3 maps.